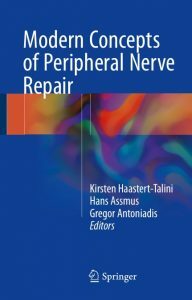 This book focuses on posttraumatic repair and reconstruction of peripheral nerves. Written by internationally respected specialists, it provides an overview of the challenges and the latest advances in diagnosis and treatment of traumatic peripheral nerve injuries. It presents an outline of state-of the-art procedures from diagnostics, including newest imaging techniques, over conventional and alternative surgical approaches to clinical follow-up and rehabilitation, including the latest concepts to improve functional recovery. The purely clinical topics are preceded by neuroanatomical principles and neurobiological events related to peripheral nerve transection injuries and followed by an outlook on current experimental developments in the area of biomaterials for artificial nerve grafts and peripheral nerve tissue engineering. Peripheral nerve injuries not only affect the nerve tissue at the site of injury, but also target tissue and parts of the central nervous system. They often have dramatic consequences for patients, including loss of sensory and motor functions combined with paresthesia or pain, and a reduced quality of life and ability to work. An adequate understanding of the procedures for proper decision-making and reconstructing peripheral nerves is therefore essential to ensure optimized functional recovery.